I love when readers/fellow bloggers share their own creations with me! Halloween decorations can all start to look the same after a while. The lovely Jori of Shivers of Delight decided to change it up and craft this “Gentleman Crow” to grace her front porch this year. You can see some in-progress shots and read more about it HERE! You’ll find lots of other spooky goodness on the site as well. Are you doing any unique decorations? This entry was posted on October 2, 2015 at 4:41 pm and is filed under craft, creatures, decoration, halloween with tags craft, creatures, decoration, halloween. You can follow any responses to this entry through the RSS 2.0 feed. You can leave a response, or trackback from your own site. Ha! 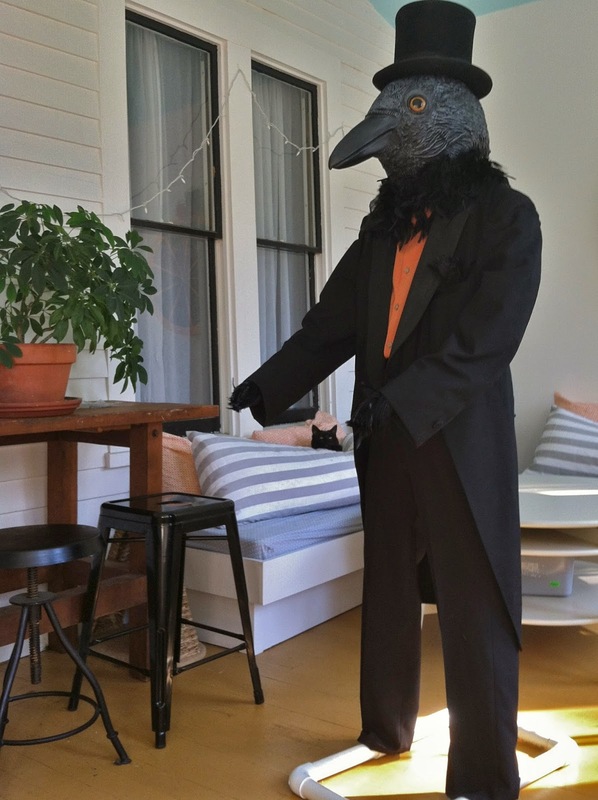 Is that a… crowscare? awwww…. So cute! I love Gentleman crow! Oh my gosh! I just saw this. Halloween is keeping me too busy to keep track of what other bloggers are doing. I’ll set aside time today. I hate to be so busy that I miss what everyone else is doing. Thanks so much! Do I see a black cat peaking out from behind the striped pillow on the bench behind him? LOVE! Ha! Yes, that is Cotton. I didn’t notice she was there when I took the picture. I just noticed the cat, now that you pointed him out. Very nice touch.